Starwind V2V Converter Free Tool Update – What’s New? 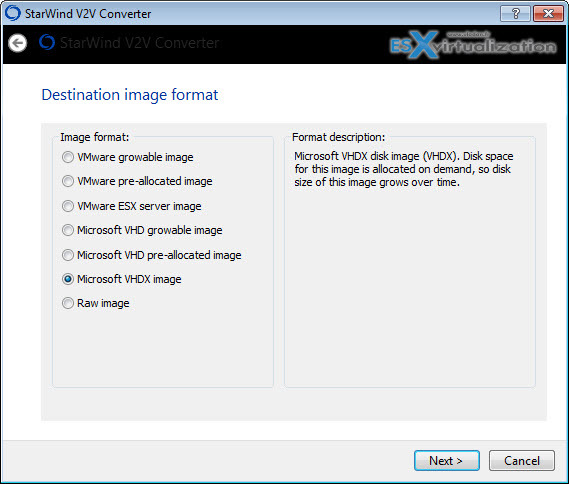 StarWind V2V Converter free tool allows the user to convert VMs from one format to another (back and forth). From VMware to Microsoft or from Microsoft to VMware. What it does it basically clones the VM so the original stays as is. There is no risk. It comes as a free utility from Starwind but it is also bundled with any version of StarWind Virtual SAN. The V2V converter has been just updated to version V8 Build 161. The new version of Starwind V2V converter brings some new features and enhancements over previous release. You can check my detailed post on How-to convert VHD to VMDK with Free Starwind V2V Converter here. Starwind V2V Converter Free Tool – what’s new? MS VHDX disk format – It requires running on Windows 8/2012 or higher version of Windows. Windows Repair Mode – may be activate for converted image, allowing virtual machines to adapt to hardware environment of new hypervisor automatically. Command-line utility extended to support VHDX format and repair mode option. New style of GUI in V2V Converter Wizard. Help file added to installation. VMware growable image. Designed to run in VMware Workstation`s environments. Disk space for this image is allocated on demand, so disk size of this image grows over time. It has *.vmdk extension. VMware pre-allocated image. Designed to run in with VMware Workstation`s environments. Disk space for this image is allocated at the moment of its creation and is fixed. It has *.vmdk extension. VMware ESX server image. Designed to run in with VMware vSphere environments. Disk space for this image is allocated at the moment of creation and it is fixed. It has *.vmdk extension. Microsoft Virtual Hard Disk growable image. Designed to be used with Hyper-V virtual machines. Disk space for this image is allocated on demand, so disk size of this image grows over time. It has *.vhd extension. Microsoft Virtual Hard Disk pre-allocated image. Designed to be used with Hyper-V virtual machines. Disk space for this image is allocated at the moment of its creation and is fixed. It has *.vhd extension. Microsoft VHDX image. Designed to be used with Hyper-V 3.0 virtual machines. Disk space for this image is allocated on demand, so disk size of this image grows over time. It has *.vhdx extension. converts the virtual machine disk image that is located in the root of D: folder into the VHDX file that will be stored in the root of the G: folder as well. When vhd or vhdx disk cannot be mounted on Windows successfully for some reason and the data stored on the disk image became unavailable, user is forced to run the Windows repair tool in order to try and get their data back. This happens, for instance, in case of major hardware changes beneath the disk image. Usually, such an issue requires manual interruption and the whole process is pretty time consuming. Download StarWind V2V Converter V8 Build 161 here!